Making choices about your major career, or graduate school is an important part of your life. 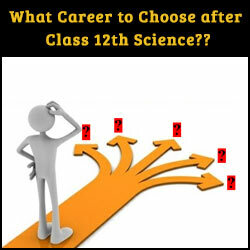 Choosing the right career option after 12th class is the turning point in the life of every student. Therefore a student himself has to take this important decision of choosing the right career choice for you. In order to make career choice you should know about your inner self. Once you become familiar about likes or dislikes then try to explore your choices regarding your career. In this regard you can also take advice of your experienced elders. Once you have select your field of interest then choice of university comes which has too much importance to get right education. In this advance age girls/women are doing as much work as men. Women and girls have more opportunities to face all the challenges of this world. They are doing more productive work than men. In this age girls should not depend on others rather they should support their family financially. In these days we see that girls are doing well in their studies. They are acquiring higher merit than boys and in the universities girls are more successful than boys. Keep one thing in your mind that you should choose subject that enhances your skills. Keep your interests in front of you. Women have achieved good positions in high level of government and private institutions. There are many fields in which girls can do more beneficial work than boys. I will tell the fields one by one. After passing 12th class, a student has to choose one professional field to study among a huge number of options available. And this single decision decides his fate and future. Dear fellows! Here I would give you some information about professional courses or career options after 12th class in Pakistan. In order to choose your desired field of interest, you should go to this article thoroughly. The field of pharmacy is very beneficial for girls. They can study B- Pharmacy. There is a good scope of pharmacy for girls. Pakistani universities are well known all over the world in providing quality pharmacy education to the students. There are good opportunities for girls in different pharmaceutical companies in Pakistan. After getting a pharmacy degree, girls can do job in pharmaceutical production field, Clinical Research field and microbial field etc. Biotechnology is also very beneficial field for girls. They can choose this field. Biotechnology has that much scope beyond your imagination. You can consider these medical fields too. There are many job opportunities for girls in the field of medicine. Now you don’t need to worry about when you have chosen FSc pre-medical because there are unlimited fields in medical. Lecturer: The second best career option for girls is teaching. They can become a good teacher. There are unlimited opportunities for girls in the field of teaching. They can chose many science and arts subjects. For example Mathematics, Chemistry, Zoology, Botany, Biochemistry, Statics, Economics, English, Islamic studies, Social studies, Pak studies, Arabic, Applied Psychology, Geography, History and many more subjects. Agriculture: There are good opportunities for girls in agriculture field. You can choose Bsc (Hons.) in Agriculture (plant pathology). Fashion Designing: Fashion designing is the most suitable field for girls. If you have creative abilities then this field is very beneficial for you. Courses in fashion designing include BFA, B-Design, bachelor in fashion designing and textile designing, fashion marketing etc. You can be a renowned dress designer or jewelry designer. Jewelry designing is offered by Beacon House University (BNU) and Pakistan Institute of Fashion Designing (PIFD) Lahore. You can gain expertise in Glassware and Ceramics from Multan Campus of PIFD. Beautician: Girls can choose this field and earn a lot of money. You can become makeup artist, Hair stylist and can open your own parlor. You can take practical training from different vocational institutes and different beauty parlor offer professional courses to girls. Chef: There are many opportunities for girls to become a chef. You can be trained in chef courses. There are many renowned institute offering professional chef courses in Pakistan. You can start your career as a chef. Media Field: The field of mass communication is also a good option for girls. You can become an Actress, an Anchor, Newscaster, News reporter, Singer. There are many courses in field of performing arts. There are many courses offered in national academy of performing arts Karachi and many institutes like that. You can do courses in film making, Acting, Directing, Script Writing, production design etc. Air Hostess & Pilot: This is also a good profession for girls. You can get professional training from aviation institutes in Pakistan. This career can be chosen after intermediate. Computer Fields and IT: There is too much scope for girls in the field of computer and IT. There are many programs offered called BSCS (Hons.) And BS (IT), BSC (HONS.) in Computer Science. There are many computer fields and different professional courses are offered for example Web & Graphic designing, Auto CAD, Data Base Administration, Web Site Development, Web Engineering with PHP, Multimedia 3d Animation and many more. These professional courses are very beneficial for girls. Telecommunication: The field of Telecommunication is a good option for girls. They can get job in different call centers and telecom companies. You can do Bs telecommunication and IT and other related courses. Library and Information Sciences: Most of the universities are offering BS (hons.) in library sciences and MLIS. It is a good field for girls. Political Sciences & International Relations: In this modern age, the girls can represent their country/Area. Political science is the study of political activities and philosophy of government. Girls can choose this subject if they are interested to come on higher level and represent youth of their country. Girls should come in this field for the sake of their country. IR is a field also related to political sciences. The scope of International Relations has greatly expanded in modern times. International Relation is concerned with every form of interactions among different nations for example foreign policy, International law, International Policies etc. Girls can choose this field also. Social Work and NGOs: Social work is also a good field for girls. They can work in different NGOs and international institutions too for examples UNISEF, WHO, FAO and many more. There are many job opportunities in this field. Creative Writer: Girls can choose this field because it is very beneficial for them. They can enhance their capabilities by doing professional courses. In this modern age there are many career chances for girls. They can become a script writer or novel writer or column writer. Commerce: Girls can also choose the field of commerce as a career. They can do B.com in commerce. There are many opportunities for girls. They can work in office. Management Sciences: Girls can choose the field of business administration. Bachelors in business administration can be done in many fields for example marketing, HR, finance etc. They can also gain the degree of CA/ACCA. Banking and Finance: The field of banking and finance is open for girls. They can do the jobs of Accountant, Mangers, Audit Officers, Business Development officers and many more jobs. Special Education: Girls can also choose the field of special education because they can get high paying jobs in different special education institutes on high level. There are many special education institutes in Pakistan and you can get teaching jobs in these institutes you can do courses in Hearing Impairment, Mental Retardation, Visual Impairment, Physical Disability, Multiple Disabilities. There are many institutes like Pakistan association of the deaf and many other renowned institutes from which you can get benefit. Physical Education & Sports Sciences: The field of physical and sports sciences is also very favorable for girls. Physical education is a multipurpose field and main purpose of physical sciences is to safeguard against deteriorating health, to cope up with unhygienic environment and to promote health. They can be a part of women hockey team, cricket team, an athlete, table tennis and many other sports. Environmental Sciences: An environmental science is very easy and interesting field. Girls can choose this field. Pre-medical students can choose this field. Food Science and Technology: BS Food Science & Technology is professional degree with vast career opportunities in Pakistan. Only few Universities in Pakistan offer this degree and after that you can get high paying jobs. The Degree holders can work as Food Technologist, Food Engineer, Food Chemist, Food Analyst, Production Manager, Quality Control Manager, Quality Assurance Officer, Product Application Officer, Food Inspector and Food Researcher in the areas of food Pharmaceutical and Cosmetic Industries, ministries of Health, Education, food & agriculture and Science & Technology, academic and research organizations etc. Therefore this degree is proved to be so much favorable after doing FSc. Architecture & sculpture making: Many girls are doing architecture engineering and sculpture making is also a good option. The name of NCA is on top among arts fields. You can also do Interior Designing course if you have great interest in arts. Law: There are also good career opportunities in the field of law. If they want to fight for the rights of innocent women then they should join this profession. You can also do BA-LLB course, it is a 5 years program offered by many universities in Pakistan. I have mentioned almost all the field in which girls can make their future career. The choice of field should be totally on your personal interests and priorities. Dear students now you should be clear that which options you have for your future education. Do proper hard work whether any field you chose because that is the key to success. Can I do applied psychology after fsc pre engineering? It is really one of best site towards Carrier counseling. Loved it. It helped me alote . thank you so much.